From a block away it would seem like an uneventful Sunday evening in Fort Greene, Brooklyn. The rain had transformed the old snow into slippery slush and cold puddles, and seemed to turn the whole city grey and drab. But if you wandered down Dekalb Ave towards Vanderbilt Ave you could hear it, faintly at first. The sounds of Soul, Reggae, and Disco slowly building as you got closer, these unfamiliar sounds piquing your interests until you reached it. You could see them through the windows, dozens of men, women, and children packed into The Great Gorgiana. Some listening to 45 records on their own, others chatting away and sipping glasses of wine and cans of Modelo. 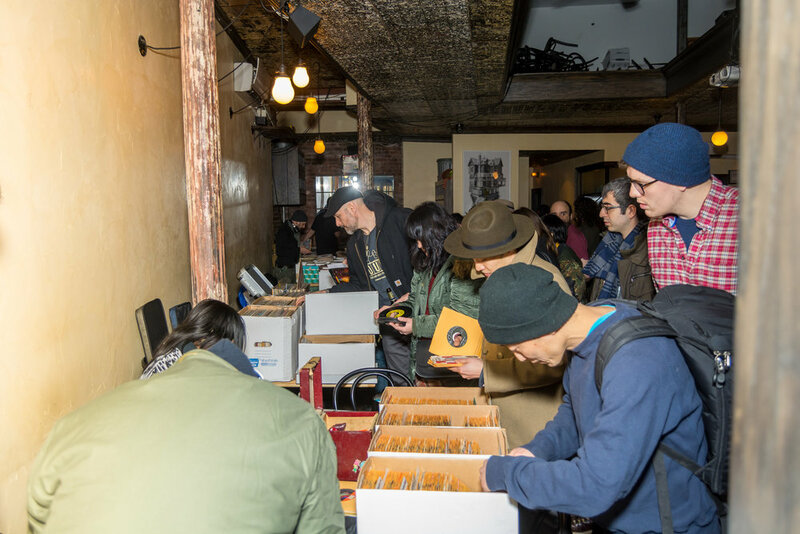 When you crossed the threshold into the cramped bar you could tell why so many people braved the elements to come to Big Crown’s Pop Up record shop this weekend. Big Crown Records is an independent record label based in Brooklyn, founded by Leon Michels and Danny Akelepse. Founded last year, Big Crown has made a splash in the indie label scene with artists like acclaimed soul singer Lee Fields, fronting Lee Fields & the Expressions, Lady Wray, a one-time chart topping platinum single artist whose been working with Michels since 2013 at Truth & Soul Records. While Big Crown is known for their Soul revivalist aspects, they don’t limit their talent to one genre. Bacao Rhythm & Steel Band is a German outfit, recreating hits like 50 Cent’s “P.I.M.P” with a Caribbean pan band feel. Inside The Great Georgiana was just short of pandemonium. On the left were dozens of boxes of records, mostly 45’s, for patrons to thumb through and buy. The records were mostly soul and funk, a fitting mix that matched the identity of the label that organized the event. Sammy Davila manned one of those tables. “We all know each other [in the record community]." Sammy said. “So it was easy to get everyone together for this.” Sammy, whose been a collector for over 20 years, was one of few who had brought records to sell at the event." On the left was the bar, what may be the tiniest kitchen in Brooklyn pumping out great bar foods, and finally the Big Crown table, selling t-shirts and records. Their artists’ singles and LPs covered the table, with shirts hung on a make shift clothes line strung for this event. The music was provided by a handful of DJs, each filling the cramped bar with sounds both new and old, crossing genres and styles. In between the two there were scores of people, talking, eating, drinking, listening to records on their personal players, and even trading records that they had brought from home. The Great Georgiana seemed to be a perfect locale for this pop up shop, even with the tight quarters. The stamped metal ceilings, soft bare hanging lights, tiled walls in the back, and even the bathroom wallpaper, depicting some of the seedier scenes of New York in a classic style, all of it complimented those packed inside. Working the bar was Dominic Tracy, owner and for the night at least, bartender. His relationship goes back much farther than the pop up shop. Through the afternoon and evening those who came in and out of the event were welcomed into the fray of music and conversation. Everyone seemed to know everyone, like a meeting of friends old and new. Through the little space there was to find children ran, brought by those attending the event, as well as those who put it together. In the small clearing near the DJ booth some danced and enjoyed the night. Some merely popped in, barely long enough for a song, and others stayed for hours. But no matter how long they stayed they all seemed to leave with a smile on their face. For this day the bar felt more like a family reunion than anything else. In between DJing and mingling, co-founder Leon Michels talked the event, as well as Big Crown’s future.